The quality is outstanding and this is a beautiful ring. The slight curve makes it fit perfectly against my engagement ring. Danforth was the only store that sold something like this, and luckily the price was just right. I'm trading th 2.5 in for a 3 mm ring and the exchange process so far ha gone smoothly. I'd recommend danforth to anyone! 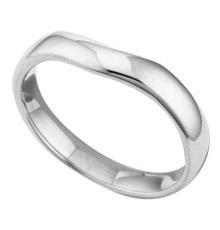 This 2.5 mm 14k white gold wedding band is designed to contour to engagement rings with larger center stones, irregular shapes and rings with side stones.